Especially for the child whose body is floppy and has little head control, it is important that seating be designed so as to help the child gain more trunk (body) and head control. Before designing the seat, it is a good idea to check how much head control and trunk control the child has, by holding him in a sitting position, It is often best for the mother or family member to do this, and it is essential that she understand the principles involved. To check head control, sit the child on your lap or on a firm object. With your hands, provide just enough shoulder or trunk support to keep the child sitting upright. With your fingertips, position the head straight up. Then gently lessen the head support to see if the child can hold (or partly hold) his head up, even for a moment. Catch the child's head softly with your fingertips when it begins to fall. To check trunk (body) control, sit the child firmly and hold his body just under his arms. Gradually move your hands lower on his body to find out how low the support can be for him to keep in an upright position. If he can keep his balance and remain sitting upright when you hold him low at the hips, he is developing fairly good trunk control. This boy's mother was surprised at how much trunk control her son had. Use the least amount of support needed to help the child do the most she can for herself. For special seating, this same principle applies. 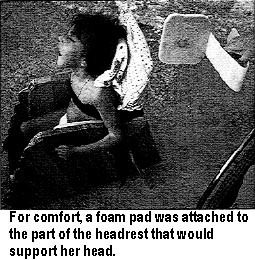 It is often helpful if the seating is adjustable, allowing the child to sit in positions for stimulation as well as for relaxation. JAZMÍN was 3 years old when her mother first brought her to PROJIMO. Her brain had been damaged at birth. She still had almost no head control. 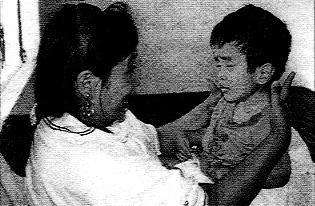 When her mother tried to sit her up, her head fell forward and her body flopped to one side. She had spent most of her life lying in a crib. 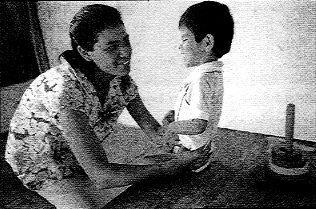 At PROJIMO, Mari (one of the coordinators of the program) showed Jazmín's mother several activities that she could do to help Jazmín gain more head control. These included the "fingertips at the base of the skull" activity shown on page 37. After working with Jazmín's mother to evaluate her daughter's abilities and needs, Mario (a carpenter who is paraplegic) and Mari designed and made a special seat for her. It was basically a plywood box with the seat, the back, and width measured to her size. Jazmín's large head tended to fall forward even when she was tilted somewhat back. So Mario made a headrest that angled backward from the seat back. That way, Jazmín could rest her head against the headrest without her head falling forward. But although this let her rest comfortably, it did little to help her gain head control. 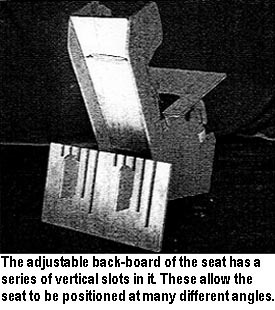 For this reason a piece of plywood was prepared, with slits of different lengths, so that it could lift the back of the seat to different heights. A soft chest band helped to keep her from slumping forward. 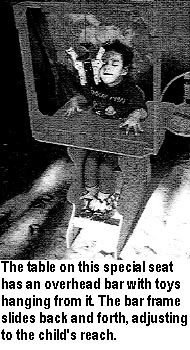 Because the angle of the seat could be adjusted securely in 5 different positions, her mother could experiment, seeking the angle at which Jazmín was barely able to keep her head upright. Over time, this would help her develop head control. 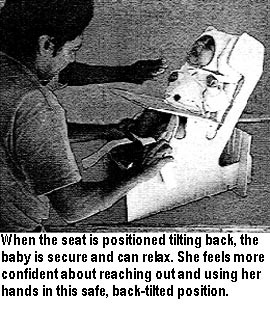 As her control improved with the combination of special seating and fingertip exercises, her mother could leave Jazmín sitting longer in the upright position before letting her rest in the back-slanting position. 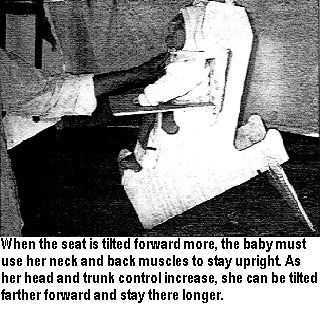 And, little by little, she could tilt the seat further forward, encouraging yet further improvement in head control. 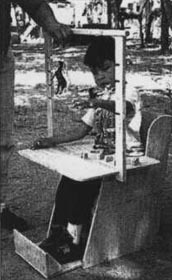 Mari also encouraged Jazmín's mother to talk with her daughter when she did any activity with her. Jazmín's mother learned to move bright colored objects in front of her face, encouraging her to follow them with her eyes and to try to lift her head. 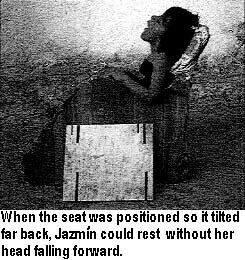 A problem with Jazmín's seat was that her body still tended to flop over to the right, with her head hanging over the side of the seat. 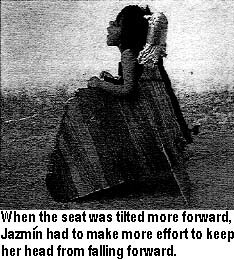 To help Jazmín sit straighter, the team made wedges of layered cardboard and positioned them to hold her hips in place and to center her body. But still, her body and head flopped far over to the right side. By experimenting with her hands, Mari found that when Jazmín's head was supported gently on the right side, this kept her upper body from flopping over to the right. She thought a head support on the right side would help. But it should be easily removable. 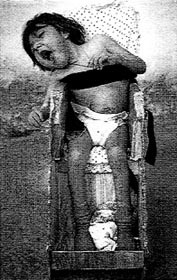 Removing it at times might help Jazmín become less dependent on it, and it might encourage her to keep her body and head upright. Eventually, the side-support might not be needed. Armando made a simple, easily removable, side-of-the-head support by heating a piece of sheet plastic over a flame and bending it as shown below. With the right side of her head supported in this way, Jazmín could sit much straighter. The thin plastic support was rather flexible, so that when Jazmín pushed her head against it, it would bend a bit. This permitted some head motion. 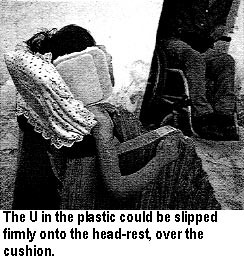 Yet when she stopped pushing, the support would gently move her head to a straighter position. With the help of head-control exercises and a special seat designed to meet her needs, together with more stimulation by her mother, brothers, and sister, Jazmín began to gain better head control. Once she could hold her head up, she took more notice of action and movements around her. Adjustable-position seating designs similar to the one made for Jazmín have been modified and adapted by PROJIMO to meet the needs of many different children. 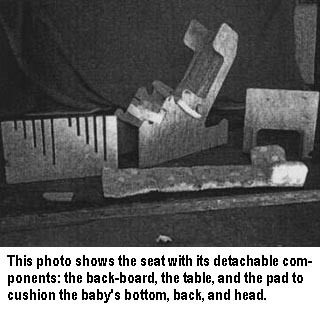 Here is an example of a seat for a baby named FÁTIMA, who had floppy cerebral palsy and developmental delay. Many of the seats built at PROJIMO include an adjustable overhead bar from which colorful toys, rattles, and bells can be hung. These attract the child's attention and stimulate her to lift her head, reach out, and start to develop hand-eye coordination. 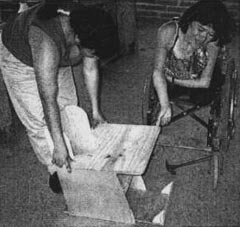 The mother of Tinín, a child with cerebral palsy, helps Irma build a special wooden seat for him.